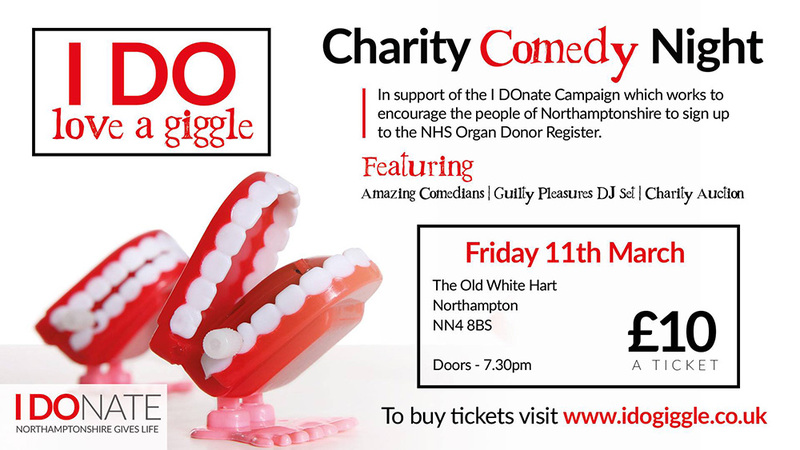 A Charity Comedy Night in support of the I DOnate Campaign which works to encourage the people of Northamptonshire to sign up to the NHS Organ Donor Register. Come and enjoy some amazing comedians, featuring: Alan Hudson, John Gordillo and Dave Byron. Plus a guilty pleasures DJ set and a Charity Auction with incredible prizes from the likes of Jeffery West, Daniel Granger Hairdressing, Natural Coaching, My Health Hut, The County Cricket Club and more!